Ten-Percent.co.uk Limited is a small, specialist online Legal Recruitment consultancy, established in April 2000 by two of the current directors, Jonathan and Clare Fagan. We are privately owned and concentrate on the recruitment of Solicitors, Legal Executives and legal support staff. Over 10,000 solicitors are registered with us and we work with hundreds of law firms across the UK. In 1999 employment agency work was all done by post and over the telephone. Jonathan had spotted a gap in the market. Recruitment is so easy. At least, that’s what we are told by everyone we spoke to. When we set up the business we thought that money would be pouring in, the company would be global within 6 months, and within two years we would be retiring to live offshore in Bermuda or the Cayman Islands! We were so confident of our future success that before we had even earned a penny we decided that it would be a great idea to commit to donating 10% of our profits to charity. We went a step further by calling ourselves Ten-Percent.co.uk Limited which has bound us to the obligation ever since! It took us just under 12 months to get our first commission – a crime solicitor in a high street practice in Suffolk. The company was operated by a mobile phone using WAP (remember that?) as Jonathan continued to practice as a high street solicitor in Nottingham, and most evenings were spent working on our online presence, contacting solicitors firms and trying to recruit more candidates. Running a start up company – learning to programme and set up a website from scratch, dealing with Companies House, learning sales & marketing techniques and holding down a full time job – meant that there wasn’t a lot of time to do anything else! Leisure time became a thing of the past..
After a couple of years in practice, and rather a lot of weekends and evenings spent running Ten-Percent Legal, it was quite obvious that something had to give. Jonathan gave up his day job and became our first full time recruitment consultant. At the time we were based in Oadby, Leicestershire and within a year or so we had an office in West Yorkshire as well, even though the majority of our work has always been in the South East of England. In 2003 we moved the company office to Mold in North Wales (near Chester). After realising that trying to do accounts and run a business is guaranteed to ensure complete frustration and lots of heads banging on walls, Pearl McNamara joined us to handle our finances and avoid too many late nights wrestling with VAT returns on Sage! By 2005 we were working across the UK, concentrating on permanent legal jobs. Four other consultants joined us and the legal job market had never looked better.. We began looking for larger offices and increased all our advertising budgets etc.. as we anticipated a rapid expansion in our sales still further. Alas, after forming in 2000 as markets were on the up, we experienced the flip side of running your own company as the recession hit us hard in 2008. Our sales figures went off a cliff as a good proportion of our business was in permanent conveyancing, a bad place to be in 2008 as a good number of conveyancers ended up out of work – stacking shelves at Tesco and driving buses became commonplace. Fortunately we were able to reduce our overheads quickly and thanks to our experience in legal careers (we provided extensive legal careers services at the time) we survived; in part due to a contract we were awarded by the DWP – career coaching newly unemployed professionals. 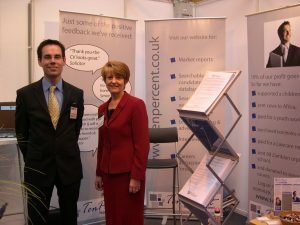 In 2011 we launched the UK’s second unlimited legal recruitment service (LawStaff Online was the first) and developed www.tenpercentunlimited.co.uk to enable firms to avoid agency fees altogether whilst still receiving recruitment agency services. By 2015 our business has evolved still further. We now undertake about 50% locum work and 50% permanent placements, with law firms who have joined our unlimited recruitment service and also those who use our standard recruitment agency model. Over 10,000 solicitors and legal executives are registered with us – a good number stay with us for the duration of their careers. We estimate that over 1,500 law firms have used our services since April 2000. We get over 60,000 hits per month from lawyers using our recruitment services and law students using our legal careers information portal. We get a very significant proportion of our work through personal recommendations from candidates and clients whom we have already assisted. In 2002 we established a charitable trust called the Ten-Percent Foundation. For further information about our charitable donations to date you can visit the Ten-Percent Foundation website. We have maintained our commitment to donating 10% of our profits through good times and bad times, and are always on the lookout for new projects to support. Ten-Percent Legal was Investors in People Accredited in 2008. 3. We do not telephone you constantly, bombard you with emails or turn up on your doorstep! We will contact you by email and text with new vacancies and a monthly newsletter, and apart from chasing for interview feedback we do not make it a habit to harass candidates. Child Care, Civil Litigation, Clinical Negligence, Commercial Contracts, Commercial Litigation, Commercial Property, Company/Commercial, Compliance, Construction, Conveyancing (Residential), Corporate, Crime, Debt Recovery, Employment, Family/Matrimonial, Housing, Immigration, Insolvency, Intellectual Property, Landlord & Tenant, Law Costs Draftsmen, Mental Health, Mergers & Acquisitions, Pensions, Personal Injury, Planning, Plot Sales, Prison Law, Private Client, Probate (Contentious), Professional Negligence, Property Litigation, Public Sector, Real Estate, Shipping Law, Sports Law, Taxation, Trademarks, Trusts & Tax, Welfare Benefits, Wills & Probate. We hope you find our services useful. If you have any comments, positive or negative, please email us – you can find the link to do this on our contact page. We are registered for VAT and registered under the Data Protection Act. We hold £2 million Professional Indemnity Insurance, £2 million Public Liability Insurance and £10 million Employers Liability Insurance. Our vision is to be seen as a reputable and reliable recruitment service for law firms and legal departments across the globe. At the same time to provide a cost-efficient service to all users and offer free & paid ancillary services running parallel to our main legal recruitment business. We aim to be innovating at all times and have services on the site that are not available anywhere else. We want to promote the concept of donating Ten Percent of annual profits to charity and encourage other companies to do the same. To provide a recruitment service that does not just put candidates and clients together but develops the structured relationships that last for many years. To ensure that the Ten-Percent Legal Recruitment brand is so well known that it builds value and goodwill.